A formal visitation schedule, or parenting time order, can alleviate many of the problems that parents face when attempting to raise their children while living in separate households. Parenting time orders can be established through the Court either separately, or as part of a paternity or divorce order. Schedules are usually dependent upon the child’s age, school and social activities, and the distance between the parent’s homes. Establishing a visitation schedule can be accomplished by following some simple steps. Determine which method is appropriate in your specific situation and initiate the process of establishing a legal visitation schedule. Many states and counties have self-help or pro-se assistance available on their websites. Check your state’s and county’s sites for the legal forms you will need and basic information on how to initiate a suit. During a divorce, temporary visitation will need to be established shortly after filing of the divorce suit. If you and your spouse cannot agree on a schedule, a Judge will make one for you. The temporary schedule will be used during the course of the divorce, up until the divorce is final, and a permanent schedule is established. A permanent visitation schedule will be included in the final divorce decree. If you are divorcing from your child’s stepparent, or you are a stepparent, check with an attorney in your state to see if it allows stepparents to establish legal visitation with their stepchildren. Some states do not. If your state does, the process will be very similar to, or the same as, the process for biological parents. In a paternity suit, a visitation schedule will be included in the final order of paternity, which will also establish legal parenthood, custody, and support. As part of the paternity proceeding, the Court will decide custody, visitation, and support. These issues can be agreed upon by the parties, or left entirely up to the Judge. If you would like help initiating a paternity suit, contact your local child support office. Because establishing paternity will mean that one parent may owe child support to the other, the child support division of your local Court will help you with a paternity suit. If a divorce or paternity has already been completed, and no visitation schedule established, you may petition the divorce or paternity Court to establish a separate visitation order. You and your child’s other parent may agree on a schedule or allow the Judge to decide what the schedule will be. Check with the clerk’s office or your attorney to determine if your state has parenting time guidelines and to obtain a copy of the guidelines. Many state’s guidelines will contain very specific visitation schedules for children in all age groups. If the schedules in your state’s guidelines are appropriate for your family, the Court may order you to follow the schedule in the guidelines. This is commonly referred to as ‘guideline visitation’. Determine if supervised visitation is more appropriate in your situation. If there is any question about your child’s safety while with their other parent, you may need to ask the Court to order supervised visitation for a period. Common reasons for supervised visitation include a parent’s long absence in the child’s life, physical or sexual abuse, drug and/or alcohol abuse, and domestic violence. A friend or family member, a mental health provider, or a professional supervisor will be appointed to supervise visits. Visits may take place in your home, your child’s other parent’s home, or the professional’s office. Decide if there are any restrictions that should be placed on visitation. Restrictions may include limiting visitation to public places or a certain person’s home, requiring a third party to be present, or restricting a parent’s right to transport their child anywhere. Common reasons for restrictions may include a parent not having a proper home in which to visit with the child and a parent having a medical condition that may affect the child’s safety. For example, a diabetic parent who passes out often may not be safe to leave alone with a young child, and the Court may require the parent’s visitation take place with another adult present. Prepare a basic visitation schedule, keeping your child’s age, school and social activities, and the distance between your home and the other parent’s home in mind. If your schedule deviates from your state’s guidelines, be prepared to justify the deviation to the Judge. The Court will focus its concern on what is best for your child, and not what is convenient for you, and will expect you to do the same. If you and your child’s other parent get along well and believe you do not need a written schedule, you can agree to ‘reasonable visitation’, which will leave the schedule open for you to decide between yourselves on a weekly or daily basis. Allow your child to call, email, text message, or write letters to their other parent at all appropriate times. Parenting requires more than just a visitation schedule, it requires a relationship, and communication will help foster a good parent-child relationship. Most states require parents to allow the other parent phone calls, emails, and text messages, at all reasonable times. Remember that child support and parenting time are two separate issues. Withholding visitation from your child’s other parent because their child support payment is late or they are behind in their payments can get you held in contempt of Court. The Courts consider child support and visitation two separate issues because taking a child’s parent away from them harms the child, therefore, it should not be done simply because the parent is not honoring a financial obligation. Encourage your child’s other parent to exercise their visitation rights, but if they frequently fail to do so, consider revising the parenting time schedule. While failure to comply with a Court Order, such as a visitation order, can cause one to be held in contempt of Court, the Court cannot force a parent to visit with their child, and will not hold one in contempt for not doing so. If you intend to ask the Court to order supervised visitation, you should prepare a list of friends and/or family members who are able to supervise. If you and your child’s other parent can agree on a supervisor you should do so. Ultimately, the Court will choose the supervisor. If you are having problems communicating with your children’s’ other parent, you may want to consider limiting communication to email or text messages in order to avoid verbal confrontations or limiting the topics of your conversations to the children and their activities. 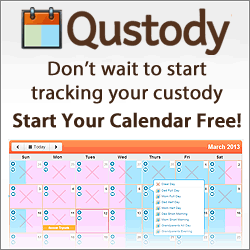 The Court can restrict custody and visitation if parents cannot get along with each other. Remember, parenting time should be based on what is best for your children, and will not always be what is best for you. Withholding visitation from a parent because they are behind in their child support payments is not only unfair to your children, but can get you held in contempt of Court. Stick to the visitation schedule even when it is inconvenient for you. It can be greatly disappointing to a child if their parent consistently fails to show up for scheduled visits, and it can cause the Court to restrict your visitation or stop allowing it completely. If you have a visitation order that allows ‘reasonable visitation’ instead of a written schedule, the custodial parent will ultimately decide if and when you may visit with your child. If there is any chance of the two of you not continuing to get along, or of them changing their mind about allowing you visitation, get the schedule written into the Court’s order. Article provided by wikiHow, a wiki how-to manual. Please edit this article and find author credits at the original wikiHow article on How to Establish Visitation Schedules. All content on wikiHow can be shared under a Creative Commons license.